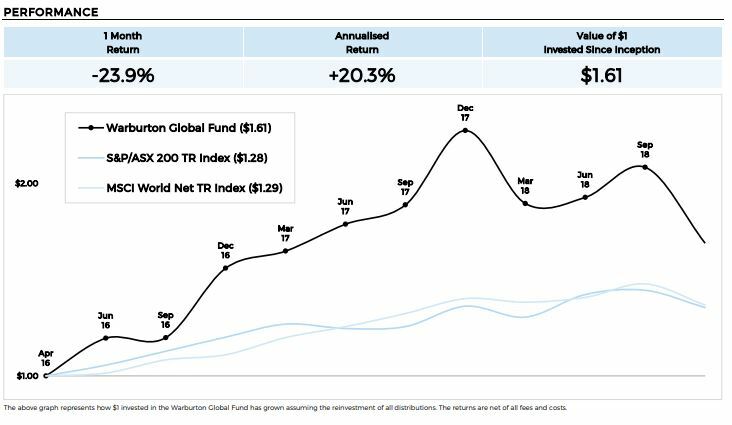 Series 1 units of the Warburton Global Fund returned -23.9% in October. October saw significant decreases across the board and the Warburton Global Fund could not avoid negative return in this month. The majority of losses were from equities (-17.7%), with fixed income (-4.9%) and commodities (-3.5%) making up the remainder. The Warburton Global Fund made a modest profit from their currency book (+2.2%). Series 1 units of the Warburton Global Fund returned an unavoidable -23.9% in October. The value of $1 invested since inception is $1.61. Equities were down in a lot of geographies and falls in energy and industrial metals outweighed the gains in precious metals. Warburton Global Fund managers state that the fall in asset classes will not persist. Long-term investors will understand that the fund has historically bounced back. Warburton Investment Management manages client capital via the Warburton Global Fund, a global macro hedge fund that deals in international investments. The fund invests in public equity, fixed income, currency and commodity markets worldwide. Founded in 2015, Warburton Investment Management is one of the best performing firms in the hedge fund industry, with a mandate to target annualised returns of over 30%.